Bear with me, the link I am about to make is tenuous. It’s often disappointing when something that you wanted to believe was true turns out to be nothing more than a sham. In the case of the Wizard of Oz, that sham was a wizard who sustained the myth of his powers using smoke and mirrors, shielding his worshippers from the reality that he was just an ordinary man from Omaha who got lost. Thanks to the power of fiction, the wizard effected a happy ending by proving to Dorothy and her friends that the answers they were seeking were always within them. When it comes to wine investment, there has been no shortage of instances when people wanted to believe something to be true. Rudy Kurniawan is perhaps the most famous recent fraudster, but don’t forget about the case of Labouré-Roi’s fake pinot noir or even the somewhat mythical Thomas Jefferson bottles, documented in the book The Billionaire’s Vinegar. We need not travel too far to find cases of wine fraud. A daily visit to Jim Budd’s blog keeps us up to date with just about every instance of nefarious activity in the wine investment world, some elaborate and some not. The latest story that caught my eye was that of opportunists attempting to capitalise on clients of the now-defunct wine investment company European Fine Wines. EFW was a company that many of us wanted to believe was the real deal and free from the troubles associated with other collapsed wine investment firms, but deep down there were plenty of suspicions floating around. This all came to fruition in 2014, when EFW’s phone lines went unanswered and the staff had reportedly been ‘sacked’. Indeed, once the company went under, it left behind a trail of unhappy former clients and dubious practices. Sadly, they did so right under our noses. On three occasions in 2012 and 2013 it held tasting events where, looking back, it seemed to wish upon itself all the scrutiny and suspicion it could muster. 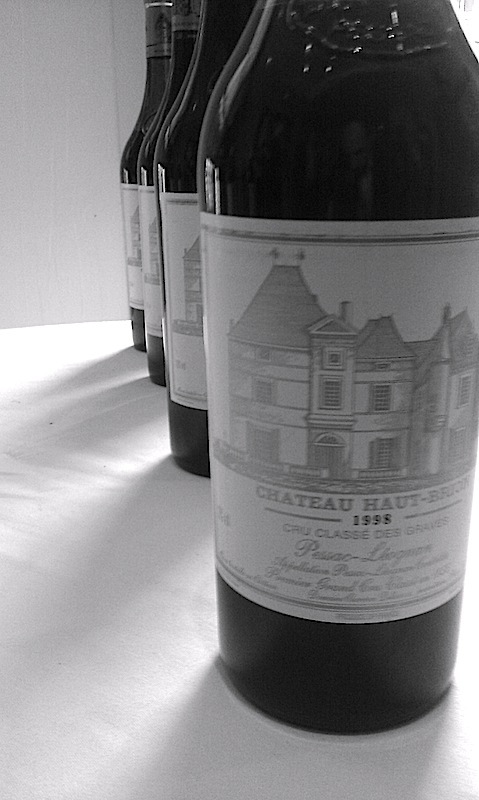 I wrote about the first of these tastings back in May 2012, where the wines lined up on the table consisted of Haut Brion, Cheval Blanc, Yquem and more from the 1998 Bordeaux vintage. The event was peppered with clients and journalists alike, but any scrutiny that was in the air was drowned out by a fog of first growths. Later that year, the company held a Christmas tasting. The first growths were fewer in number, but the volume of financial journalists attending was uncanny. If they had something to hide, they were doing an unbelievable job of hiding it out in the open. It was at this tasting that an unhappy client’s story of cold-calling and potential mis-selling (unverified), began to raise my suspicions. What he told me was all too familiar. A slick sales person from EFW cold called him and sold him a story about the thick profits that could be made by investing in wine and how EFW would handle everything for him. The person on the phone was pushy and persuasive, of course, and managed to part the client and his money with ease. And because this person knew nothing about wine, especially not Bordeaux, EFW sold him second-tier wines from lesser vintages at prices that were very likely unfavourable. The unhappy customer was angry but realistic. He figured he had been duped, but thankfully didn’t lose a fortune. When he received an invitation to the Christmas tasting, he attended because he wanted to see for himself if the company was legitimate. I gave him my card and told him that if he wanted further help with his situation, I could recommend a few avenues for him to follow. He never did get in touch. A year later, another tasting invitation landed in my inbox. It was near the end of 2013 and this time there were no journalists present and the wines were all lower-tier. The atmosphere was also much frostier than usual. Something had clearly changed at EFW. Six months later, the company would be gone. Rather than follow the path of successful and trusted brokerages, companies like EFW seem designed to make quick profits by taking advantage of naive clients by promising fast profits. The problem is that if there is money to be made in wine, it doesn’t come quickly. Speculation is one of the ugly down-sides to Bordeaux. I think these speculators have finally, especially the Chinese and some other wealthy people, recognised you can’t make money on them. Now if you’re buying it to sit on it for 10 to 15 years ….but speculators are looking to turn things over.